Just WoW! I'll give ya $ tree-fiddy for it!?! Edited by t.r., 11 June 2015 - 08:00 AM. Thanks for the compliments guys. I hope others who have satllite scopes will post their pictures. All these little scopes are so awesome. I bet some people have one but had no clue what it was for. Please, more pictures of your satillite scopes. 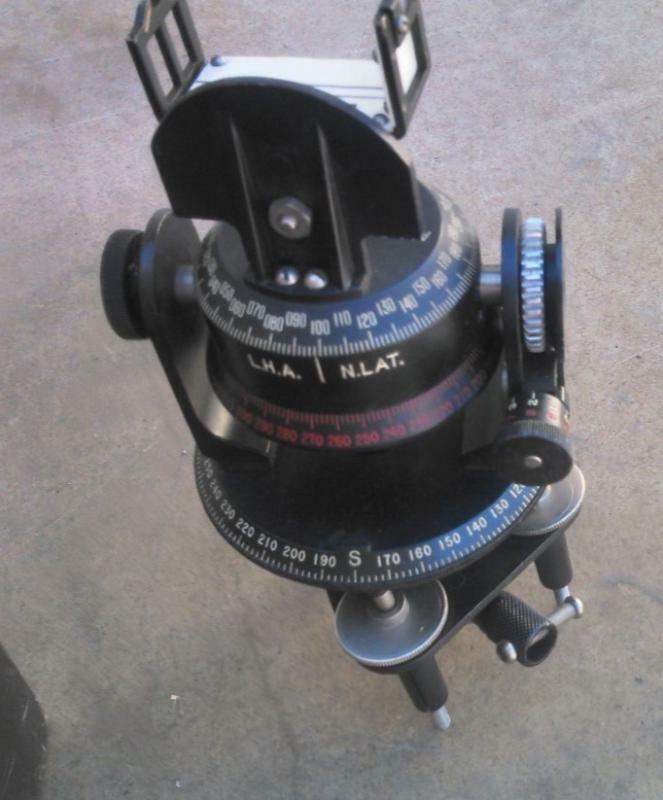 I read the Unitron ad for these scopes and in addition to use as a moonscope and wide field scope, they expressly sold them for use as a finder and had brackets for that purpose. In the "Xavier Magazine" article linked in the original post, there is mention of someone named "Van Flandern". That is actually Thomas C. Van Flandern. He was involved with the US Naval Observtory at one point. In the 1990's he hung out on the Compuserve Astroforum, which was one of the best online astronomy forums in the pre-web days. He developed some off-beat ideas, and had a website dedicated to them, here. As mentioned in the article, he died of cancer in 2009.
do you have a link our source you can share? Page 33, lower right hand corner refers to Bulletin 'S'. No picture of the bracket though. I have these brackets for one of my 4" unitrons. They are really a set of Uniclamps with unibrackets that allow the satellite scope to be mounted on a 4" scope. I am sure that they were available for a 3" scope. However, they only allowed the satellite scope to be used with Unitron telescopes. If you read the description the clamps are also mentioned about 3/4 of the way through. Edited by starman876, 21 June 2015 - 09:17 PM. I was trying to keep it short. 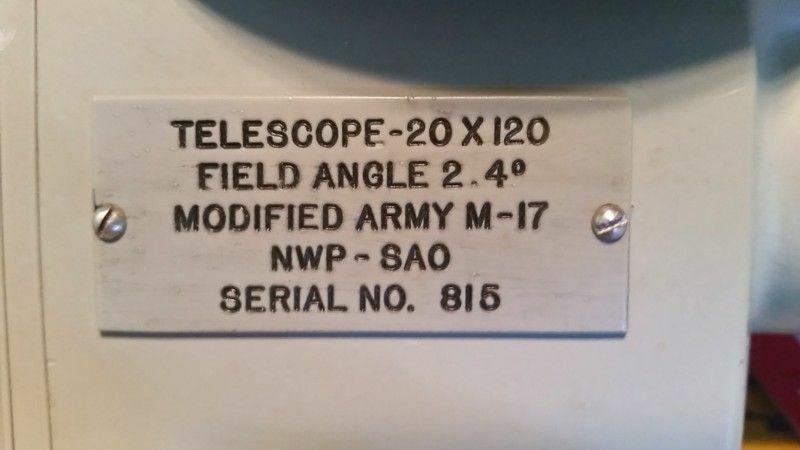 Now we need a scan of Bulletin - S.
So did anyone here win the EBay Goodwill elbow telescope auction last week that included one of the Navy 20x120 "Apogee" scopes? I was keeping an eye on it but seemed like folks picked up on what it was and got out of the range I was going to pay. I wanted it badly enough to place a bid but lost. 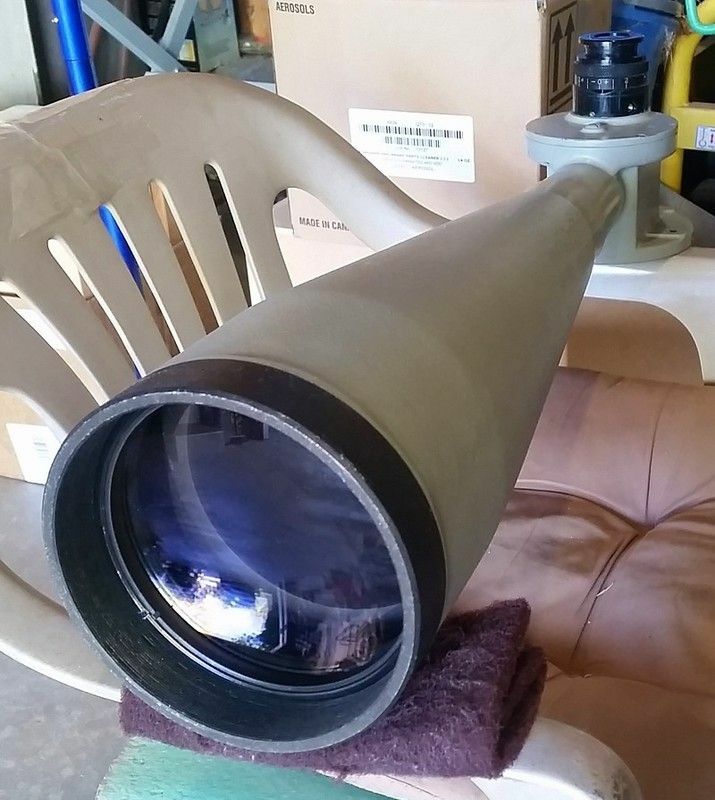 But it turned out for the better because I ran across an entire Tscope 16" structure minus optics for the same price and I needed the Tscope really bad for a 15"f/6 mirror I have and with my hobby budget I could not have bought both. I would someday like to own a 20X120 Modified and a Edmund Satellite scope. Nice catch on the TScope! I keep bailing on the Apogee scopes (3 that I have seen) since condition has been questionable plus I already have a 130 mm f8 AP Starfire EDT that gives me the most perfect 20x view with a Celestron 50mm Axiom anyone could imagine. And my wife can't imagine me fitting another scope in our little house since there are 3 in the living room that won't fit in my closet. 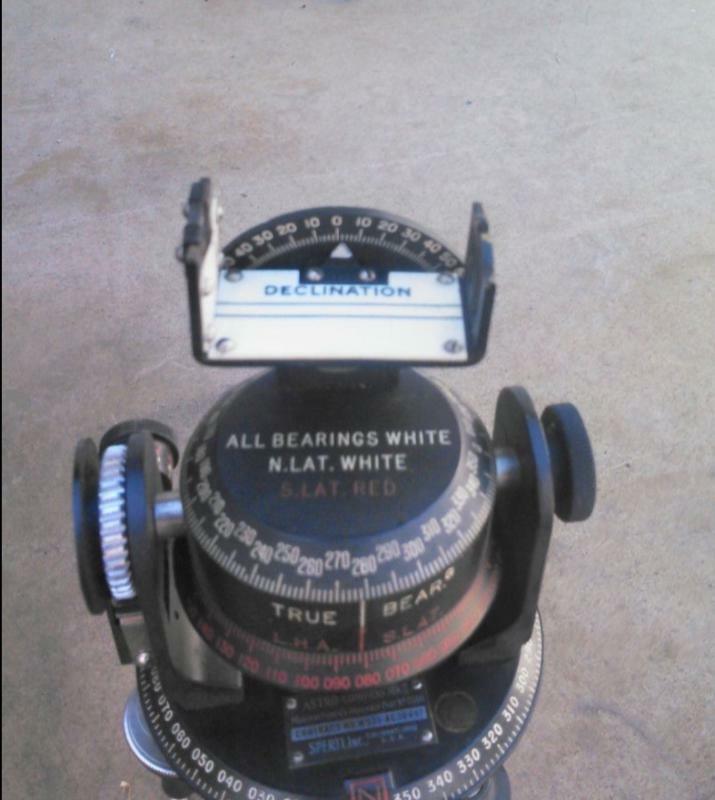 I have the same optics as the Edmund satellite scope in the form of their 6.5x50 Deluxe Finder. I got it for $25. Maybe I should get some aluminum channel, lid stays, and a flat mirror and make the rest of it. It is a fun little hand telescope with a 12 degree field and really sharp on axis. Anyway, if I did get an Apogee scope I'd need to start smoking a pipe and move to Connecticut and the weather here is too nice to leave! Edited by davidmcgo, 22 June 2015 - 09:26 PM. I just now got around to reading this thread and associated links. It brings back a lot of memories. The newspaper used to post when Echo would go over and we would go out in the backyard and watch it. It was big and bright- an orbiting radar reflector. Too bad we can't post pictures from books here because I have several from back in the 60s, one including a home-built model. J, that Unitron tracker of yours takes the prize! What a beautiful piece of instrumentation. By the way, transits and theodolites like those used to track weather balloons were widely used by the professionals for this sort of work. Those are probably cheaper and more accessible now than the amateur models. Edited by terraclarke, 25 June 2015 - 09:12 AM. These Astro Compasses are interesting devices. They were used for celestial navigation in aircraft during WWII. Edmund used to sell them for satellite trackers. They even used to offer a half of a 7x50 binocular (monocular) to put on it and plans for its attachment. I have a magazine article about building and using one from these parts that dates to the early 60s. There are still lots of them available and they are cheap, considering the work put into them and the features they have. I recently acquired two of these 20x120 "Apogee Telescopes". One in army green, the other in navy grey. I got them for a terrific price because the seller thought them damaged and couldn't make them work. I thought I might make a working telescope using parts of both, but as it turned out, I got them both working. The green one is still being worked-on, I'll present it at a later date, but the grey one is now fully operational. And I have to say, I was impressed when I got it up and running. Both use 5-inch achromatic objectives. While the green one is cemented, the grey one is air-spaced and fully coated. It appears to be a Fraunhofer since the spacing is nearly 1/8". It came to me with the crown element flipped and the objective cell threaded too far down the tube, explaining why the seller could not get an image to form. The green one has the 4-position filter wheel, the grey one had the reticle illuminator. The green cone is die-stamped aluminum and quite thin, the grey cone is cast aluminum and much heavier. The grey cone also has three molded baffles on the inside. My overall impression is that the grey one is a better-engineered unit. There is a small clam on the rear of the flint element in the grey scope, I have blacked it out and it doesn't affect the imagery. No clams in the cemented objective of the green scope. Focusing/diopter adjustable eyepiece. This one came with the reticle illuminator collar, which I removed. A bronze screw fits into the open hole to plug it when the illuminator isn't used. Seems like a low serial number to me. The reticle shifts a bit when focusing, I need to figure out how to keep it in focus at all diopter settings. But the image is clear and sharp. "In February 1957, SAO staff met with scientists and engineers from the Vanguard project. The navy scientists had done calculations that predicted that the IGY satellites might rise to as high as 2,500 miles, well beyond the detection capabilities of the basic Moonwatch telescope. 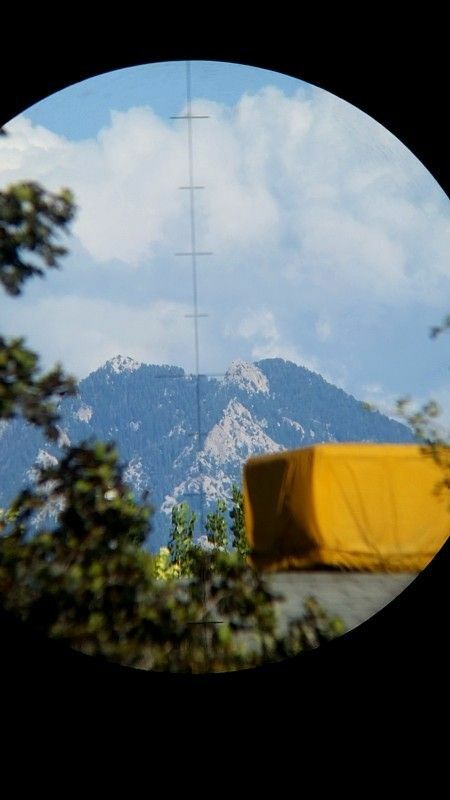 The Naval Research Laboratory and the Naval Gun Factory offered to provide dozens of "apogee telescopes" to strategically located Moonwatch teams at military bases in New Mexico, Arizona, and California as well as sites in South Africa. The high-powered telescopes had substantially greater magnification and light-collecting ability yet sacrificed the large field of view that the standard Moonwatch telescope provided. This meant that observers using the apogee scopes would have to be more alert and carefully positioned to ensure that a faint satellite did not elude them." Next is to figure out a suitable mount. This scope is very heavy. The one that sold on eBay a few months ago, on a smallish EQ-2 style mount, would definitely be undermounted and quite shakey. I'll post pics of the green one once it's fully functional and re-assembled, as well as the two side-by-side. Nice!!! Is that a yellow truck in the photo delivering the next batch of scopes to your house? That's a covered air conditioner on a roof a block away. These scopes have very limited focus travel and were meant to be used at infinity exclusively. The scopes come by special courier. Has anyone tried using their Project Moonwatch scopes to spot a satellite? Very nice Chuck. You luck into some nice scopes. with the two you could make some fantastic binoculars. I've got two 127x700mm air-spaced, coated objectives in cells for that project. Very nice Chuck ......Ya know if you have a telescope chair like Roberts ( actionhac )...... You're gona get the CLAMS . Neato torpedo! That is a nifty scope Chuck! 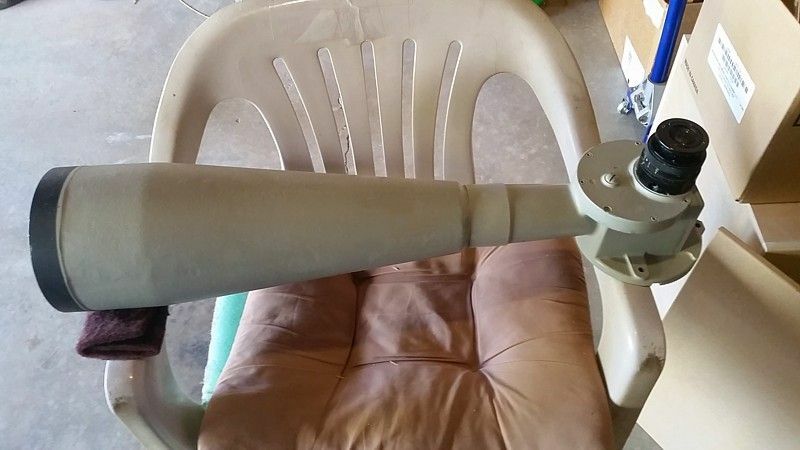 It looks like the military kluged them out of surplus WWII M17 elbow telescopes and replaced the shorter f.l. 50mm objective with the 120mm lens. Is it an F5? I remember years ago, a guy had one of the unmodified 50mm M17s mounted on an 8" Newt as a finder scope. Even the original unmodified model was quite heavy. It would have made a nice door stop! 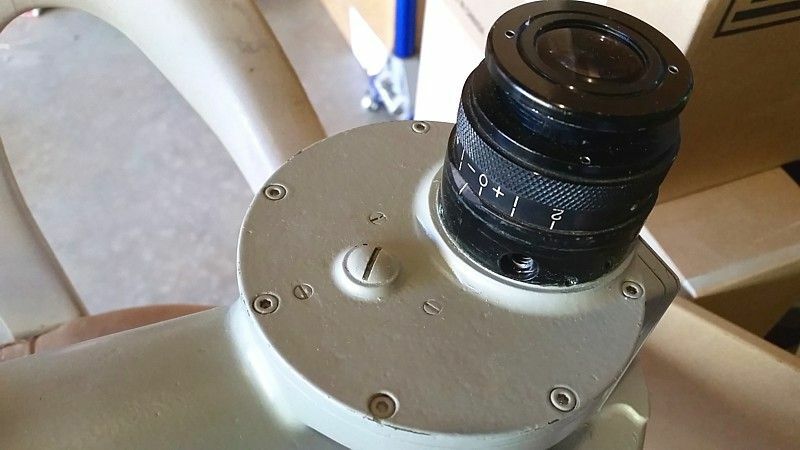 They did have a very nice erfle eyepiece. Does your have the yellowish, thoriated glass?